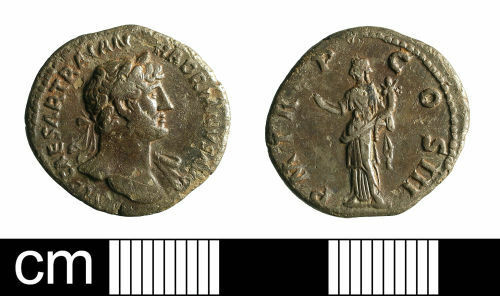 A silver denarius of Hadrian (AD 117-138); P M TR P COS III (Felicitas standing left, holding caduceus and cornucopiae) reverse; minted at Rome, AD 119-122. Ref. : RIC Vol. II, p. 350, no. 83. Dimensions: 18.8mm diameter, 1.9mm thick. Weight: 2.6g. Obverse description: Laureate head right, drapery over left shoulder. Reverse description: Felicitas standing left, holding caduceus and cornucopiae.